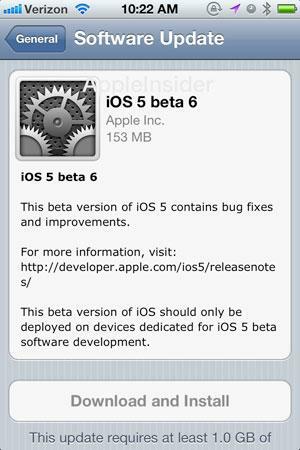 More specifically, Apple issued iOS 5 beta 6 build 9A5302b, iTunes 10.5 beta 6, Apple TV Software beta 5, iWork for iOS beta 2, and Xcode 4.2 and iOS 5 SDK beta 6. The 144MB (153MB CDMA) update arrives roughly two weeks after Apple issued beta 5 of iOS 5.0, which introduced few noticeable changes over beta 4 when the company began testing over-the-air (OTA) updates to developer's iOS test devices. Due for release this fall, iOS 5.0 includes over 200 new features that will be available to iPhone, iPad and iPod touch. Among them are Notification Center, an innovative way to easily view and manage notifications in one place without interruption; iMessage, a new messaging service that lets users easily send text messages, photos and videos between all iOS devices; and Newsstand, a new way to purchase and organize newspaper and magazine subscriptions. With iOS 5.0, users will also gain access to the company's iCloud service and will be able to activate and set up their iOS device right out of the box, downloading software updates over the air with no computer required. Meanwhile, readers who discover new features in the latest beta can share their findings by tipping news (at) appleinsider (dot) com.